Been doing a lot of reading and not enough writing the past few weeks, getting taxes sorted, preparing for SXSW and doing some SOPA follow-up. Sarah Houghton has a great post about ebooks, the current situation with some publishers opting out of providing ebooks to libraries and what she is doing about it at her library. I agree with her that if we want to solve the problem, we need to be honest about what we’ve been doing and what others have been doing, notably publishers that are making it difficult for us to provide their titles digitally. Libraries want to do this and we can’t. Patrons should know that, and know why. As a librarian and as a reader, I am tired of publishers walking away from the library table. I have no problem with them walking away from a particular third party vendor, but only if they have a plan in place to offer up their own platform or be signed with an alternate vendor already. Gaps in service, gaps in availability of their titles to our patrons equals stupidity in my opinion. Walking away from the library eBook market makes no financial long-term sense, nor does it continue the positive relationship that publishers and libraries have cultivated for centuries to help bring information and entertainment to people. Bobbi Newman also has some scripts you can use when talking to patrons. I don’t know how much it will help, but we might as well all sign this petition to the White House. 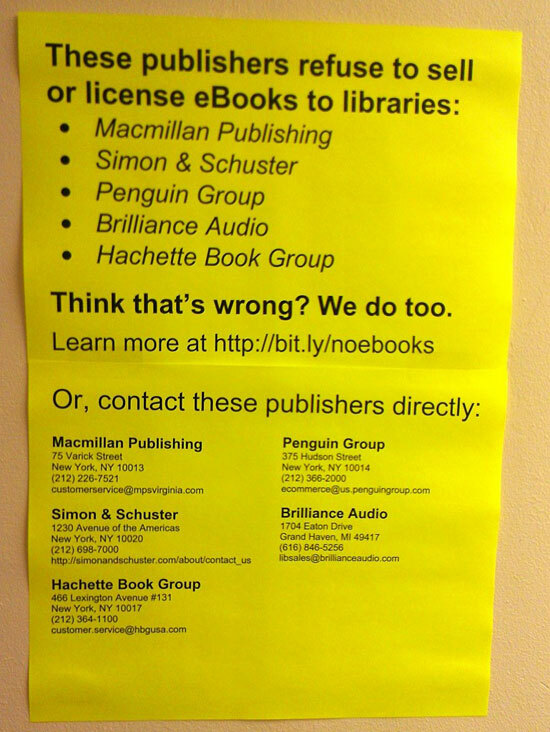 The situation with ebooks, publishers, and vendors is not sustainable long term. Thank you for including a link to my post! I wrote a mea culpa this morning pointing out that Penguin did not stop working with libraries they just stopped working with OverDrive, which happens to be the dominate vendor for ebooks in public libraries. I think my original post and scripts are still relevant but I think it’s also important that we’re clear about what happened. Interesting that these are the same publishers involved in a new investigation by the U.S. Department of Justice over e-book pricing.